"Porirua Mayor Nick Leggett has hit out at Government suggestions that councils should stick to core services such as sewage , roads and libraries. Porirua City Council's plan, which outlines spending for the next ten years includes a vision of a poverty-free city, and Mr Leggett insists it has a "moral obligation" to stamp out child poverty." A "moral obligation" no less. You, the ratepayer, have a moral obligation to ensure that other people's children are free from poverty. It's not enough that central government imposes this fatuous claim on you, he wants to duplicate it. On the upside, when the imposition becomes so localised you find yourself having to share your wages with the large family next door the absurdity and outrageousness of the proposition becomes evident. And what motivates Mr Leggett? "The Inside Child Poverty: A Special Report documentary which screened on television last year, spurred Mr Leggett's vision for the council to step up." Influenced by sensationalist propaganda which I wrote about here and here. Porirua ratepayers will no doubt be delighted with this news. 16 and 17 year olds and 16 to 18 year old teen parents who are receiving government financial assistance. From 30 July 2012, a new Youth Payment and a new Young Parent Payment will be introduced with youth-focused obligations. To qualify young people will need to be in education or training and they will have to meet certain obligations such as undertaking budgeting courses and, if a parent, parenting courses. Some of their basic costs like rent and power will be paid directly to suppliers with a small in-hand allowance paid direct to the young person and any remainder of their payment placed on a payment card for groceries. The Government has announced its intention to undertake major changes to the welfare system. One of the first areas of focus is how Work and Income will manage young people at risk of long term benefit dependency. Currently too many young people in New Zealand are not in school, training or work. In addition to this, we know more than half the young people who end up on a benefit before they’re 18 years old spend at least five of the next 10 years on welfare. These people require intensive support, attention and encouragement. We need to change the way we identify, support and manage these young people before they end up trapped in the cycle of welfare dependency – and we need your help to do it. Well, I could point out what many libertarians have in the past, that government money corrupts the impetus and motivation of charitable endeavours. However, using tax to buy ' hand-up' assistance is still better than using it for 'hand-out' assistance. "Shearer hints at harder-line welfare policy"
There's an ambiguity about the headline from the NZ Herald relating to David Shearer's breakfast speech. Harder-line than previous or than National? And does this mean that Labour will be supporting the welfare reform legislation soon to pass through the House? Or will they call for tougher legislation? The Welfare Working Group had some recommendations rejected that Labour could pick up and promote. Or is he simply indicating that Labour is dropping the ill-informed pre-election policy to extend the In Work Credit to beneficiary parents? Whatever this means, I'll tell you what I take from it. Labour realises that the public are now behind welfare reform. They either have to support National and look for votes on another platform, or go further than National is currently prepared to. Recently I had the pleasure of spending the day with James Bartholomew when he visited NZ as part of a research tour in preparation for a follow up book to his The Welfare State We're In. After NZ he was on his way back to Australia and then on to Singapore. This article from the Spectator describes what he found in Singapore. 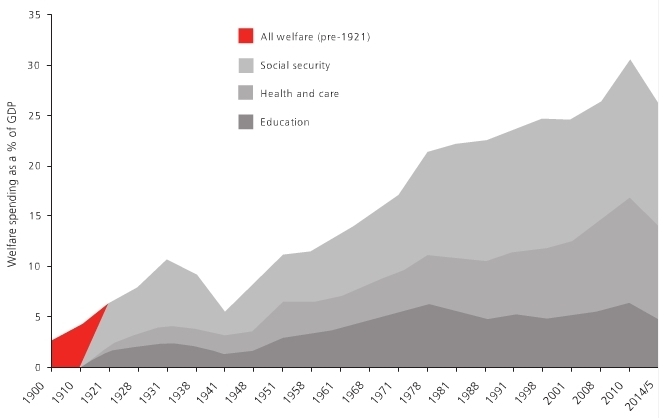 Growth in welfare has become an increasingly critical issue in both countries over the last decade, particularly for the UK. While it's the largest area of spending for both countries, it takes up a third of New Zealand's GDP compared to almost half of the UK's. 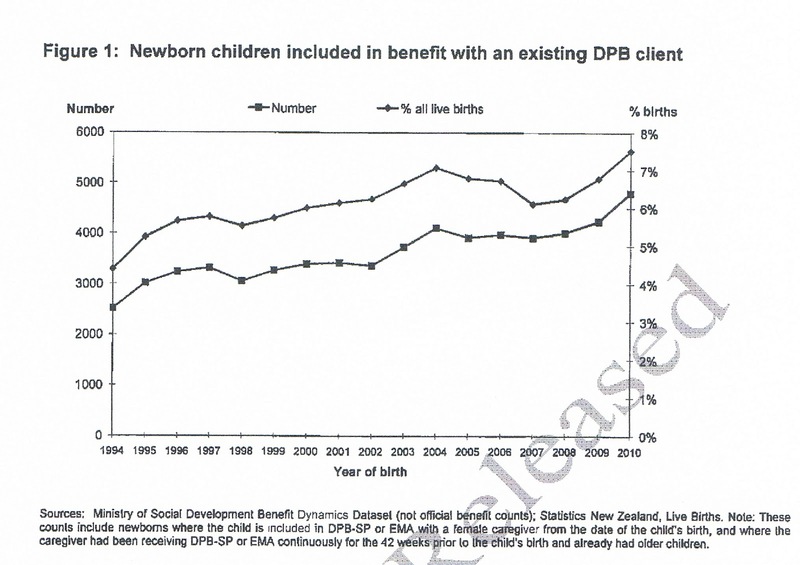 Since 2001, welfare spending has risen by four percent in New Zealand to $21.2 billion. It rose four times as fast in the UK, and now sits at 111 billion pounds (about NZ$213 billion). If welfare in NZ was taking up a third of our GDP that would be about $56 billion. Goodness knows what half of the UK's GDP is. Here is a graph from the London School of Economics. It shows that not just welfare, but education and health consume about 26 percent of GDP. In NZ the same areas of expenditure consume about 28 percent of GDP (I've used NZ$170 billion). Not sure what the Maxim writer is doing here. Perhaps intending to compare percentages of government spending but even then, the claim that in the UK welfare takes up half is quite wrong. 59 percent of the caregivers were Maori, 23 percent NZ European, 12 percent Pacific. The younger the mother appears in the system the higher the likelihood she will add further children. Those beginning aged 16-17 had a 45 percent possibility of adding further children. Gordon Campbell interviewing David Shearer. Interviewing? Actually, no it's more like cross-examining to drag out the desired response. The following excerpt relates to the DPB reforms. Hopefully Shearer will at least revert to the Labour's position pre-Goff/King's campaign promise. Perhaps other Labour MPs will line up behind candidate Josie Pagani who rejected the In Work Tax Credit extension to beneficiaries post election. Well, lets take an example: welfare reform. Welfare reform is something that many of those middle class strugglers we’re talking about happen to support. Do you think that solo parents on the DPB should be made to work full time when their youngest child turns 14,- and part time when their youngest child is five? I think you’ve really got to be careful about making things compulsory. There are many, many people out there by now who are – at the age that their children are now – who are saying ‘ I’ll go back to work again, for a lot of different reasons, and for a lot of economic reasons.” There are two issues here for me here – if you want someone to go back out to work again, there are at least three pre-conditions. One, they need to have the skills to be able to get work. Two, they need to have good childcare to be able to do it And three, there has to be the jobs. Now if you don’t talk about those three things, then there’s no point in talking about compulsory or optional or whatever. Those three things are essential pre-requisites. And what’s happening is that the government is talking about compulsion, of pushing people out while actually not providing the enabling part of it. But the point is, the struggling middle class don’t want to wait for those pre-conditions to be met. They’re happy to have welfare reform now, and seem to have a striking lack of sympathy for people on the DPB. Do you oppose the DPB planks of the welfare reform process? I don’t oppose the encouragement of getting people into work. I don’t think there’s a party in Parliament that doesn’t believe working isn’t better than being on some sort of welfare cheque, particularly for unemployed people. For DPBs its obviously slightly more difficult, in that child must come first. And for us, that’s the key issue. The other issue…is that the majority of women who are having children, who go back out to work,- and I know, because there are tons of them in my electorate here – who put their children into childcare, and are able to cope. But there is another group of people and or whatever reason – jobs, skills, adequate childcare – where they can’t do that. They don’t have that option, even if you wanted them to, or felt that was the best thing for them. So putting the child first means that – if you want to get women back into the work force – you do need those other things in place. 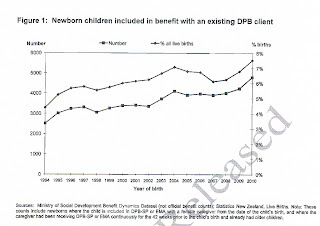 But in the real world in 2012, we’re going to have the government enacting a welfare policy whereby solo parents on the DPB will have to work full time once their youngest child is 14 – regardless of the state of the job market. There’s no quid pro quo I can see on the government’s reform agenda. So, will you oppose that measure? So that’s a yes, you will oppose it? I would like to encourage to get people back to work whenever they…as soon as possible. I’m trying to get past your preference, and get at what are you going to do when it hoves into view into Parliament. Are you going to vote against any measure of this sort, within that section of the welfare reform legislation? We have to see what it looks like. You know what it looks like. Bennett and Co. have made their intentions very clear. I’ll say to you again : I believe people should be going back to work, or going to work – because some of them haven’t been to work – whenever that is possible for them to do that, and whenever it is in the best interests of their children. But I say again – if there is no ability to get good work, either through jobs, or through skills or through decent childcare then that’s not…. And finally, can I say that those things are of such a priority to you as a pre-condition that absent of them, you will vote against that part of the legislation ? I want to look at the legislation before I tell you how I’m going to vote. I’m not going to be sitting here in the absence of a caucus discussion and telling you how I – or the Labour Party – are going to vote. Child abuse - an ethnic or socio-economic problem? High quality research would look at ethnic prevalence rates, while controlling other factors which might be an influence such as poverty, welfare status etc. I’d be very interested to also see data on prevalence rates by welfare status, once income has been removed as a factor. In other words is there more child abuse in households where no adults work, than in households where at least one adult works – but has much the same level of income. The data doesn't exist in NZ as far as I am aware. Children in poor families: does the source of family income change the picture? surveyed living standards but didn't touch on levels of abuse or neglect. In 1996 researchers compared the CYF notification rate for the general population and welfare-reliant homes and found a significantly higher rate for the latter. But the research didn't control for income. Children in families of low SES [socio-economic status] were at significantly greater risk of Harm Standard maltreatment overall. An estimated 22.5 children per 1,000 children in low–SES families experienced Harm Standard maltreatment, which is more than 5 times the rate of 4.4 per 1,000 children in families that were not of low SES. Chances are there is considerable overlap. NZ statistics show that Maori are more likely to have an unmarried, live–in partner. Which takes us back to the disproportion of child abuse and neglect amongst their children. What does need pointing out perhaps is that the vast bulk of children - both Maori and Pakeha - are not abused or neglected.